Hutchesons Bar & Brasserie, is set to received a makeover this summer as RUSK & RUSK seek to bolster its reputation as one of Scotland’s flagship restaurants. Co-founders, James & Louise Rusk, initially redeveloped Hutchesons in 2014 when they took on the ambitious task of transforming one of Glasgow’s oldest and most recognised architectural icons into a marquee dining destination. The restaurants in the RUSK & RUSK estate have become synonymous for their interior design and decor; their latest venture, The Spanish Butcher sports a modern, New York loft-inspired interior whilst legendary steakhouse, The Butchershop, is a throwback to the classic hustle & bustle of midtown Manhattan. The grandeur of the Grade-A listed building that houses Hutchesons is an exciting canvas for the group to work with, co-founder Louise Rusk describes the project as “an opportunity to further enhance what is already a gorgeous restaurant”. The new Hutchesons will feature a complete overhaul of the main dining room which will sport the title ‘Hutchesons City Grill’, whilst the the ground level Champagne bar will be transformed into The 158 Club Lounge and will have a stylish boutique ambience. On the subject of the motivation behind the project, Louise told us that “we want to keep the special aura that Hutchesons has whilst giving it more of a modern, couture feeling”. It’s not just the interiors that are changing, the menu is also being overhauled by RUSK & RUSK Group Development Chef, John Molloy, who has been tasked with putting a greater focus on steak & seafood whilst introducing dishes with a unique and original flair to them. James Rusk explains that “this is a chance for us to have some serious fun with the menu; of course we’ll retain some of the classic dishes that established us, but we’ll also be introducing some wild new creations too”. RUSK & RUSK are regularly touted as ‘Scotland’s authority on beef’, and across their restaurants they pride themselves on serving some of the finest cuts of steak to be found anywhere in the world. Whilst Hutchesons already boasts a reputation for great steak, the new concept allows the venue to push the boundaries on their current offering by introducing a greater variation of cuts along with guests steaks sourced from the finest breeds of cattle across the world. The emphasis will continue to be on using premium, dry-aged beef from the highest regarded suppliers in the UK. The refurbishments take place over a two week period in mid-July and will be complete in time for the launch of this years Merchant City Festival on Friday, July 21st, and people can expect a number of events and parties to coincide with the re-launch. On Sunday June 4th, Louise Rusk, the newly appointed Scottish Ambassador for Action Medical Research & Chair for their flagship ladies lunch fundraiser, Killer Heels Cocktails, will swap her stilettos for running shoes as she takes part in the Great Women's 10k Run. With the aim of raising as much funds as possible for Action Medical Research, Louise will be joining thousands fellow participants taking to the streets of Glasgow for one of the biggest races in the UK. Louise, Co-founder of leading Glasgow based restaurant, design & lifestyle group, RUSK & RUSK, has been involved in numerous charitable activities for a number of causes, and her work with Action Medical Research marks a new chapter in her charitable efforts. On her new position with one of the UK’s leading children charities, Louise said “Not only am I extremely excited to embrace this new role, but it’s also extremely humbling to be part of this amazing charity which does such an invaluable job, positively impacting thousands of children and their families each year”. Under the RUSK & RUSK umbrella, Louise aims to use her platform to raise vital funds for Action Medical Research to further the work that they do. When asked what it was that made Action Medical Research such an important organisation, Louise told us that “the work the charity does at ground zero with regard to research & development for cures, answers and solutions to a whole range of diseases, illnesses and ailments is so important” she continued by saying “beyond the research, it’s the support infrastructure that the charity provides to the children and families of the children to help them cope at such testing times is what really makes the organisation stand out”. Wednesday, 12th of April 2017...a date that we will long remember here at Hutchesons. For it was on this night that we played our part in the global launch of Veuve Clicquot's brand new cuvée, the Extra Brut, Extra Old. A sell out dinner in The 158 Champagne Oyster Bar, hosted by Champagne royalty; Dominique Demarville, the Cellar Master of Veuve Clicquot. What more could you ask for? Well, our kitchen team answered that question by devising a jaw-dropping menu consisting of butter poached langoustines, lamb cutlets and white crab ceviché; each course was specifically designed to compliment the various Champagnes on show that evening. You can see the full menu here. And as for the Champagnes? Well, where do we start?! Guests were greeted with Veuve Clicquot's flagship, the Yellow Label - a house staple here at Hutchesons! It was the next Champagne however, that's been drawing world-wide attention; the Extra Brut, Extra Old...the first ever low dosage wine that acclaimed Maison Clicquot have ever produced; an assemblage of wines from '88, '96, '06, '08, '09 and '10 vintages, which culminates in a beautiful colour with bright, delicate gold twinkles, superfine flowing cordon of bubbles. Poised intensity of aromas and flavours include peach and spiced lemon and a soupçon of liberating oak! From there, guests enjoyed the glorious Veuve Clicquot Rosé label before moving on to the '98 vintage; the first that current Cellar Master, and our host for the evening Dominique Demarville, brought to fruition. The night culminated in something incredibly special, the Cave Privée Rosé 1990, a Champagne that has the nose of a big, bold red with flavours of truffle and smokey oak, a truly remarkable wine. The Cave Privée range is a story in it's own, and one you can learn about here. It was a night that will live long in the memory and is another fantastic celebration of the unique partnership that Hutchesons have built with Veuve Clicquot in recent times. Stay tuned for the next big announcement as we prepare to kick off the 2017 Summer Party Series! ONE thing that we've never been afraid to boast here at Hutchesons is our love of Champagne! From our exclusive dinners to our outrageous Summer Party Series, our exploits with the Bubbly stuff has been noted in the likes of Marie Claire and Glamour, and now we've teamed with one of the worlds most revered Champagne producers to create a very special pairing available exclusively on Friday's...that's right, welcome to Krug at Hutchesons! Every year, Krug picks an ingredient that it challenges it's global partners to use with the aim of accentuating the big, bold notes of their flagship Grande Cuvée, with 2017 being Krug's 'Year of the mushroom'. Here at Hutchesons, we've grasped that notion with both hands and developed a truly unique pairing that marries our two great loves; Champagne and the very best of Scottish produce. We've enrolled the services of an expert forager who scours the forrest's and fields of Scotland in search of the most stunning and flavourful mushrooms for us to pair with a crisp glass of Krug. Along with mushrooms that include Ceps, Scarlet Elf Cup, Girolles & Morels, we've got our hands on big, bold ingredients such as wild leeks and wild garlic, to name but a few! Available exclusively on Friday's at Hutchesons, this unique pairing can be enjoyed in the Grand Brasserie or in the seclusion of The 158 Champagne & Oyster Bar! "Freshly foraged sautéed wild mushrooms, wild leeks, charred white asparagus, shaved green asparagus, confit egg yolk, nasturtium and peashoots"
The latest addition to Glasgow's restaurant scene has arrived. Welcome, The Spanish Butcher. The 3,600sq foot venue at 80 Miller Street will house a 100-cover restaurant with a wine and cocktail bar - and create 40 new jobs. Co-owner James Rusk said: "We are well known in Glasgow, and beyond, for working hard to serve up the most flavoursome cuts of Scotch beef to be found. "With The Spanish Butcher we are taking this approach further afield, introducing a very different flavour profile with Spanish reared Galician beef." Known for their eye for style, detail and interior design, Rusk & Rusk will aim to emulate the calibre of visual aesthetic that each of their current venues boast, Hutchesons Bar & Brasserie is regularly quipped as 'Scotland’s Most stylish' restaurant. With chic, modern New York loft-inspired interiors, including exposed brickwork, crittall glass windows and highly polished concrete flooring, The Spanish Butcher promises to be as eye catching as it is delicious. Group co-founder Louise Rusk said: "For us, a restaurant is about more than just the food; it’s about the whole experience, the theatre of the moment with the setting playing a crucial part in that. "Combining our focus on food, service and design we love to create lifestyle dining environments that are dynamic yet relaxed, spaces we to love to dine in." Glasgow based architects Mosaic have been appointed by Rusk & Rusk to develop the new city centre restaurant and work is currently underway. The Spanish Butcher will open it’s doors mid- November 2016, becoming the latest addition to Miller Streets burgeoning restaurant and bar scene. A-listed Hutchesons’ Hall in the Merchant City is currently undergoing a £1.3million transformation by independent restaurateur James Rusk – owner of successful steakhouse The Butchershop Bar & Grill, as he embarks on bringing a wonderful new dining environment to Glasgow’s Style Mile. Behind Hutchesons clean white façade lies a long and colourful history. Built in the early 1800s, it was designed by one of the great Glasgow architects, David Hamilton and was originally meant to be a hospital for elderly men and a school for poor boys. Owned by The National Trust for Scotland, the architectural landmark has been used as a public library, bank, school and shops, and has been lying empty for the last five years after extensive water damaged caused by storms in 2008. Set over three floors and 4’000sq feet, the A-listed white impressive structure features a clock tower in an unusual octagonal design and huge stain glass windows amongst its other charms, and is set to bring at least fifty new jobs to the city centre. “The building is steeped in nostalgia, a feeling of time standing still and I had an overwhelming urge to clean down the cobwebs, pull off the dust sheets and invite Glasgow round for dinner to feel the energy of this incredible space. “We’ve been working with the National Trust for Scotland in the background for the last two years trying to bring a new purpose to this unique, standalone building that is soaked in layers of history and culture. Councillor Gordon Matheson, Leader of Glasgow City Council and Chair of Glasgow City Marketing Bureau, said: "Glasgow enjoys an enviable reputation as a European centre of dining excellence, which is home to a cosmopolitan café culture by day and a world-class restaurant offering by night. I am delighted that the stunning Hutchesons’ Hall, which has served as a prestigious address to a multitude of organisations over the decades, is undergoing this transformation and will open its magnificent doors once again to visitors and Glaswegians alike. 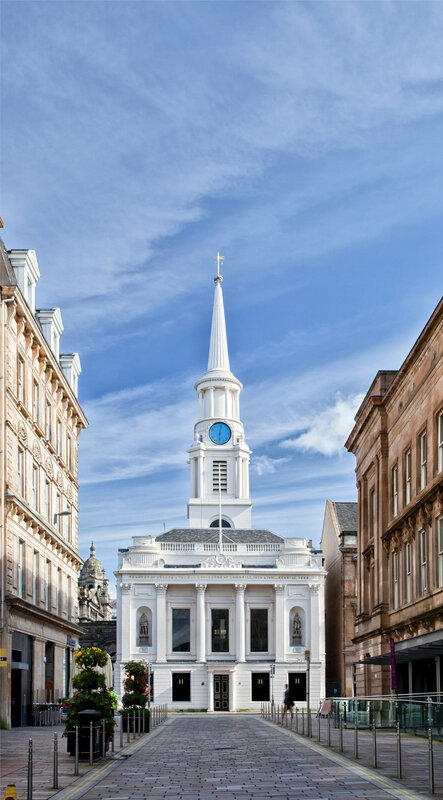 Hutchesons will be a welcome addition to the city’s impressive gastronomic scene, providing a unique dining experience and creating jobs for the city."